This goblet is built on the blowpipe. It has many constrictions in the stem, as well as an asymmetrical edge. This is a goblet built on the blowpipe. The first step is to gather glass that will become the bowl. 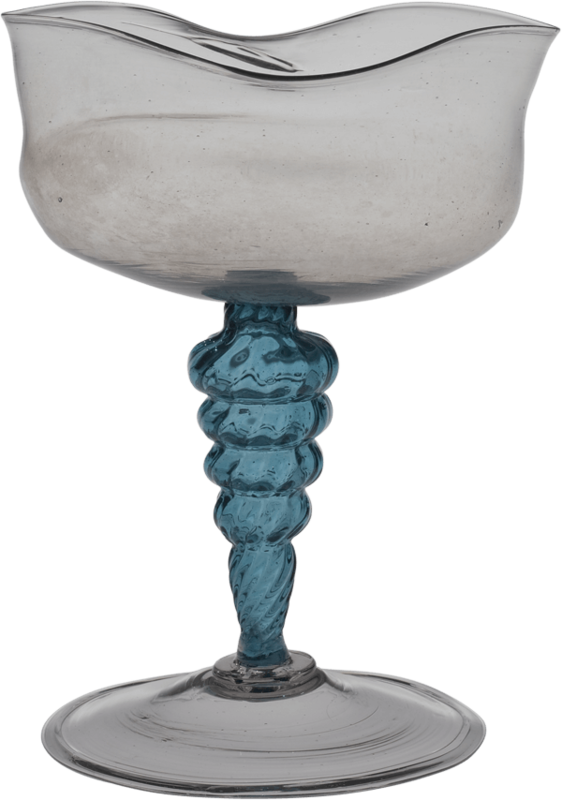 The glass is elongated with gravity and gently rubbed back and forth on the marver. This elongates the gather somewhat and makes it perfectly concentric with the blowpipe. Air is blown into the pipe, and a bubble forms. The tip is gently rubbed back and forth on the marver to cool and make pointed the end of the gather. After reheating, the process of forming the bowl begins. A constriction is created between the bubble and the blowpipe. This is essential for the transfer to the punty, which takes place later. The bottom of the bowl is made slightly pointed, and this will make centering the stem much easier. This goblet has no merese between the bowl and stem. A gather of aqua glass is lowered into a dip mold, blown hard to create ribs. The ribbed bubble is lowered onto the center of the cup, the first blowpipe twisted to create the twisted pattern we see in the ribs. The stem is cut free of the blowpipe. 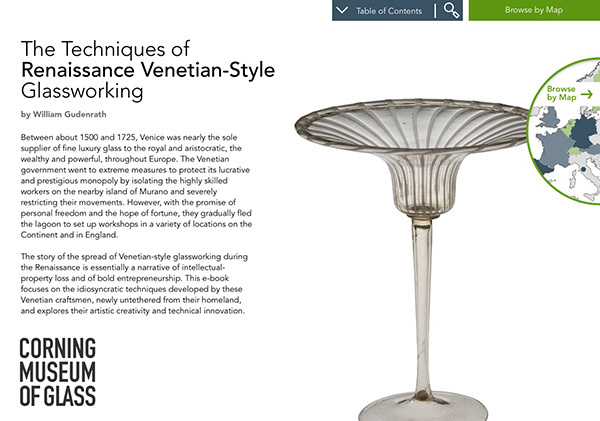 Decorative constrictions are made, and the excess glass trimmed free at the bottom. A small amount of glass is gathered from the furnace and added to the tip of the stem. This is tooled to become a merese. 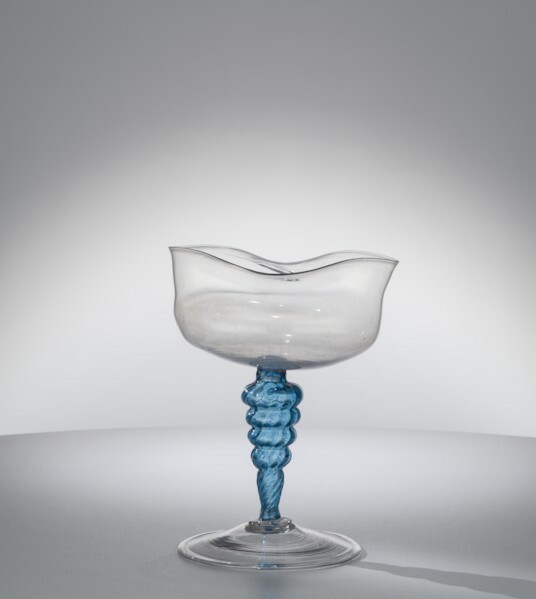 The glass is pushed upward to make a strong join with the lower part of the stem. A third bubble is added. This will become the foot. The bubble is trimmed free of its blowpipe, and a constriction is made that will allow a hole to be formed. The edge of the hole will become the edge of the foot. The two-bladed tool known as the jacks are used to increase the diameter of the hole. Air is blown on the lower part of the stem with the soffietta to keep it stiff. During the process of making the foot, the entire goblet has to be kept hot—well over 1000 degrees Fahrenheit. The foot has a folded edge; the glass is pushed inward, creating a double layer of glass. The colored glass stem absorbs heat faster than the clear foot, so it must be continually blown on to keep it stiff. Centripetal force is used to further dilate the foot bubble, and it’s given its final shape with the jacks. And the foot is given its final shape with the jacks. The site where the punty will be attached must be cooled, and transfer to the punty must be done with the entire goblet well above 1000 degrees. The neck or constriction is broken by lightly squeezing with the pincers and tapping with the right arm of the bench. The edge is reheated. After the glass is reheated, the opening process begins. The hole is opened to the diameter of about two inches. The entire bowl is reheated and softened, and the soffietta is used to make an oblate spheroid. This is preparation for the final opening. The wood jacks (or parcioffi) are smoother than the metal jacks, and they don’t leave toolmarks. A flare is made, and after a final reheat, the characteristic asymmetrical opening is made. After a final flash in the furnace, the goblet is broken free of the punty and cooled gradually in the annealing oven.